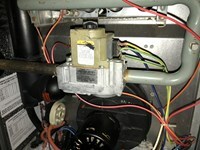 Quickly and easily replace a loud vibrating draft inducer blower in Rheem Gas Furnace. 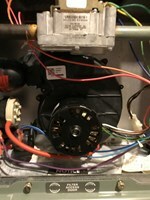 Fasco Inducer Blower that was loud and vibrating when gas furnace would start up. Inducer Plastic Air Pipe that takes air in from outside house. Old Inducer that was going bad is removed. New replacement Fasco Inducer installed in less than 20 minutes. Fasco Inducer replacement puchased from amazon. For the last two years my Rheem Classic 90 Plus gas furnace started getting louder and louder, and vibrating every time the furnace first started to run (before blowing hot air out the vents). I didn't know what the problem was, until I had my local heating and cooling company come out and do a service checkup and clean the furnace (at the end of last winter). At that time, the service guy told me that the Inducer blower was starting to go bad (probably bad bearings) and it would cost over $600 to replace (but would cost more if I needed to make an emergency call to fix the problem if the furnace stopped working completely). The service cleaning of the furnace did seem to help to quiet the draft inducer slightly, but the main problem remained, that the draft inducer was starting to fail. Well, the furnace inducer blower did make it through the end of the winter last year, but I knew I didn't want to chance things for a third year on an inducer blower that was nearly 20 years old. So not knowing anything about gas furnaces I wanted to see if it was possible for me to replace the inducer blower without having to call the heating company and paying $600+ to do the install. 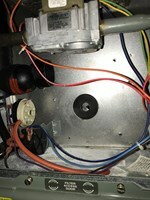 Well after taking a look at some YouTube videos, looking at the Rheem Classic 90 Plus documents, and inspecting the inside of the Rheem Classic 90 Plus furnace, I came to the conclusion that it should be fairly easy to install a new inducer myself and went ahead and purchased a new Fasco Draft Inducer (model #70623861) for $219 from amazon. 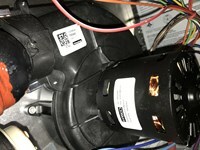 Ultimately, it was super easy to install and took roughly 20 minutes to remove the old inducer and install the new Fasco Inducer blower in my Rheem gas furnace and completely solved my problem of a loud vibrating inducer when the furnace would start running. But messing around with a gas furnace is dangerous, so if you're unsure of what you're doing always contact a professional. 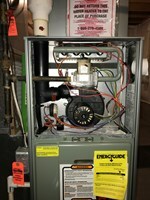 Open the furnace panel that houses the draft inducer blower. Disconnect the plastic wire clip that connects the black / brown / white wires together. Disconnect the rubber hose that goes into the draft inducer. Use a screw driver to unscrew 4 screws holding draft inducer to back panel, and 1 screw that holds the large plastic pipe to the inducer. (5 screws total). Now just carefully remove the draft inducer by wiggling the inducer off the large plastic pipe, then remove entire inducer from the inside. Clean inside of plastic piping (I had white calcium/salt like deposits that needed to be cleaned out), and also clean back wall of where the inducer gets mounted for any debris, so the new inducer mounts flush to the back. 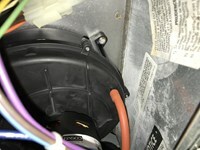 Install the new draft Inducer by attaching the inducer to the black plastic pipe to the new Inducer. Now mount the inducer to the back wall, by using the 4 screws, and 1 screw to attach the plastic piping to the inducer. Connect the plastic wire clip that connects the black / brown / white wires together. Use a zip tie to bundle wires together, to keep them organized. Close the panel to the furnace. TURN ON Electric to the furnace. TURN ON Gas to the furnace. TURN ON Heat to the Thermostat (Keep in mind, the first time I turned on the heat to the Thermostat the furnace started up and ran for a few minutes, but I could need change the heat up or down, so the first time it runs after the change, the furnace may need to cycle through. I then turned off the furnace and the next time I turned on the furnace, I could change the heat up and down. All in all, this removal and replacement took roughly 20 minutes and saved me at least $400 dollars. 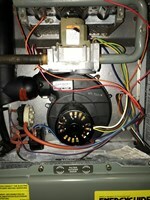 I've never done any repairs to my furnace, but this was as simple as home improvement projects come. 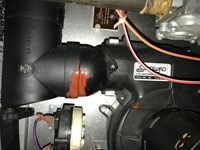 My Rheem Classic 90 Plus furnace now is nearly silent when it first starts up and no longer has any vibration that can be felt throughout the house. I'm really happy with how fast and easy this was to do myself and how much money this ultimately saved me. If you can use a screw driver, can turn off gas and electric to your furnace, this is a job just about anyone can do themselves.